Cobb.com - The Best Info About Cobb County, Georgia and Beyond. Hotel Deals, FREE Job Search, FREE Classifieds, Information, and More. What a great place to live, work, raise a family, and enjoy life! Cobb County is located only 10 minutes northwest of Atlanta, one of the most thriving and dynamic cities in the country. You can easily get here by I-75, I-285, and US 31. Cobb.com is an interactive website, easy for everyone to use! Cobb.com contains information about Cobb County, Georgia, as well as the 5 counties surrounding Cobb County. If it touches Cobb County, then we're there, also! The Cobb.com website will be expanding, so come back and visit often. We currently offer free classified listings, and will offer community forums, community chat rooms, a community event calendar, news and relevant information, business directories, entertainment, local restaurants directory, and more. Click on the links above to access Cobb Classifieds listings, Cobb Auto Classifieds listings, and Cobb Real Estate listings. 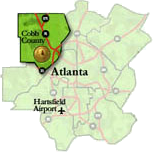 Cobb County is located in the southeastern United States, within the state of Georgia. The county is part of the original and core Atlanta metropolitan area. As of the 2007 census estimate, the population of Cobb County was 691,905, and continues to grow. The U.S. Census Bureau ranks Cobb County as the most-educated in the State of Georgia and 15th among all counties in the United States. Per Wikipedia, Cobb County is consistently ranked among the top 100 wealthiest counties in the United States. Cobb County's seat and largest city is Marietta, located in the center of the county. Other cities within Cobb County include Acworth, Austell, Clarkdale, Kennewaw, Mableton, Powder Springs, and Smyrna. Listed in Frommer's 500 Places to Visit with Your Kids Before They Grow Up, and cited by the Atlanta Journal-Constitution as one of the '35 Natural Wonders in Georgia You Must See Before You Die'. Stone Mountain Park offers a variety of attractions, entertainment and recreation activities. Enjoy a knight's tale and experience one of Georgia's most unique dinner attractions. Take a journey back to the 11th century when the splendor, the pageantry and the romance of a time long ago come to life in a re-created Medieval Times Castle. See the Georgia Aquarium, World of Coca-Cola, High Museum, Inside CNN Atlanta, Zoo Atlanta, Botanical Gardens, Atlanta History Center, and more. Atlanta's most famous attractions at one amazing price and 9 days to see it all! See the CNN Center, World of Coke, Georgia Aquarium, Centennial Olympic Park, and much more while you ride the coolest machine in the world - the Segway! The perfect way to see the 'Capitol of the South'. This spirited Atlanta tour will give you a look at the city's darker side as you jorney through downtown Atlanta, Peachtree Street and more, while you ride on the coolest machine in the world - the Segway!